My name is Srebrna and I have a little problem with blankets. A big amount of yarn made its way into my hands over the last few years – gifts, destashes and so on. None of these could be made into something specific due to limited amount of each colour/type, so I decided to divide all that stuff into colours and make blankets. Blanket one: Earth colours. Bunch of squares, made into a 10×10 square, bordered in shaded green. It usually rides with us in the car and is used in case someone is cold and the AC doesn’t kick in. Blanket two: Purples. Also a bunch of squares, but organised a bit differently. Still Work In progress, 8 squares and the border waiting to be finished. Blanket three: Blues. Squares of various blues and some off-whites, all about 30 cm. All crocheted, but not sewn together. Will go to my son’s room and serve as the bed cover. Blanket four: Purple & cream round ripple. Made from DROPS Andes yarn, 10 balls. Only one planned more or less properly. Used Excel to calculate optimum usage of yarn. Blanket five: Cotton. Specifically DROPS Paris. Hexagons trimmed with light gray yarn, of varying pattern inside. Still crocheting them, but I expect this one to be quite a headache when it comes to sewing it. Blanket six: Purple hexagons. Bunch of pinks, purples and creams from various similar-sized DROPS yarns (karisma, lima, merino extra fine). Made up only of “African flower” hexagons. Hopefully it’ll be pretty. Still only part of the hexagons done. Blanket seven: Green& brown hexagons. Kind of followup on number one, only in different shapes. Still some odds and ends of earth-toned yarn left, plus I found some green yarn probably older than me in a box, so I need to use it up. Hexagons are more effective than squares. 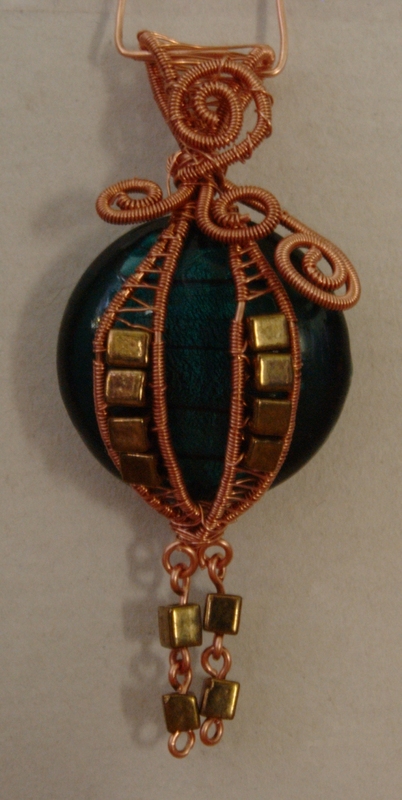 And the fourth glass coin pendant, this time it’s rich teal, with copper wire and Miyuki beads. 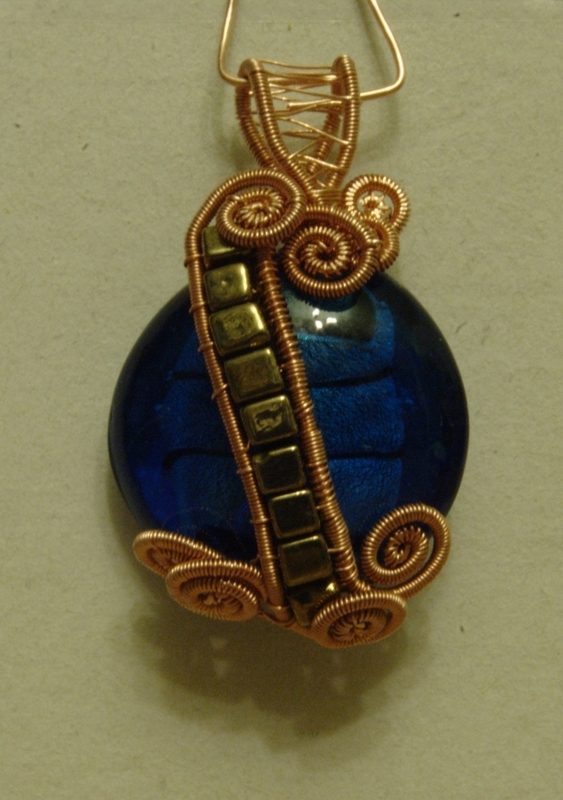 Rich blue, silver-lined glass coin wrapped in copper wire with dark gold Miyuki square beads. On my holiday visit to my parents I got some little craft shopping done and bought a few very pretty lampwork glass puffed coins in nice, rich colors. 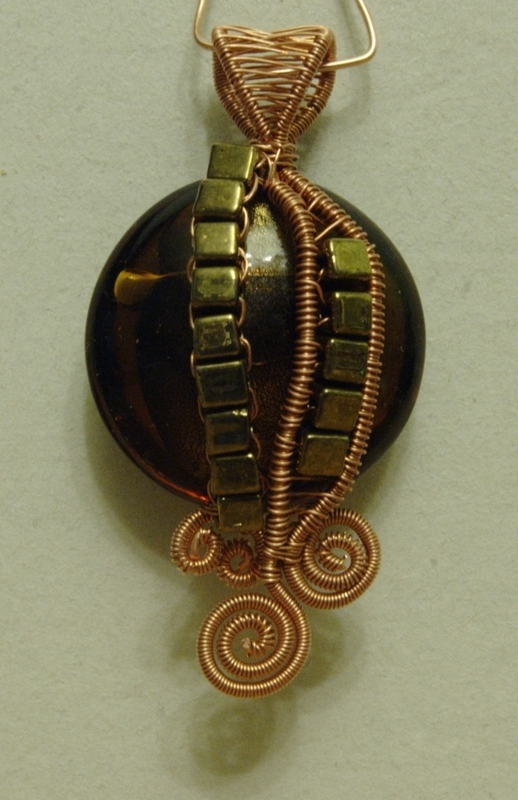 All well matching with copper wire and dark copper/gold beads. The beads are Miyuki square “dark gold” and wires are 0,8mm and 0,3mm. Long hanging hemalyke and glass earrings. 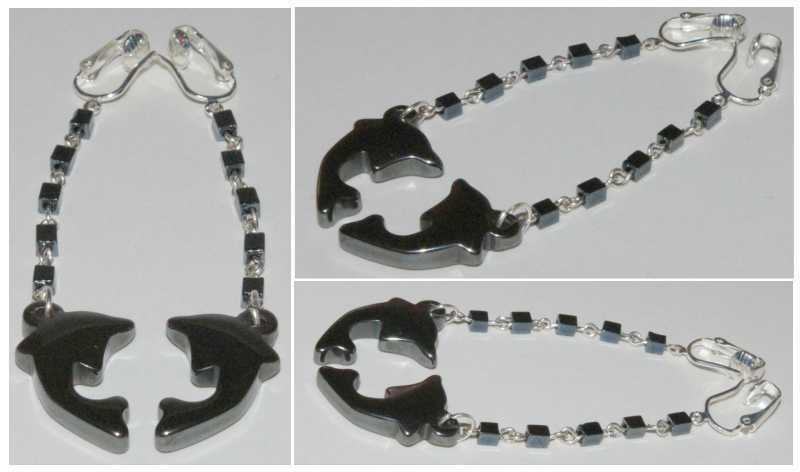 The little cubes are Miyuki Square “metallic hematite” beads. The dolphins are Hemalyke ™ charms. All together a bit on the heavy side, but wearable and really pretty.